We love it when we know the story behind the creation of a game. Unless you’ve been under a rock for the past year or two, you already know one of the most popular games to hit the market has been Czech Games Edition‘s wildly successful Codenames. This original version has been translated into over a dozen other languages and has begun to spawn new versions. 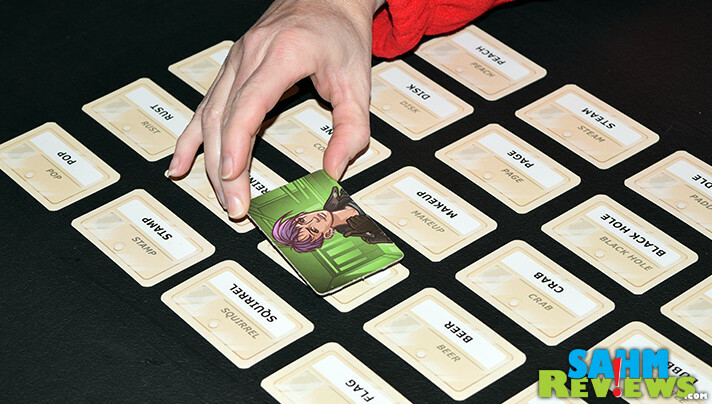 Last year’s Codenames Pictures was a guaranteed selection in our party game gift guide, and the original got an ‘adult’ upgrade in Codenames Deep Undercover, a Target exclusive. Two other versions have made the cut for this year’s gift guide listings – Codenames Disney and Codenames Marvel are fantastic choices for party games or ones based in pop culture (respectively). All of these titles have two teams of players vying to discover all of their assigned words before the other team can. Each team has a leader who gives one-word clues while the rest discuss and take an educated guess. The only downside it that the game is best played with at least six players (three on each team), and the more the merrier. Earlier this year a sixth version of Codenames was published, making it’s official debut at this year’s Gen Con convention in Indianapolis. Codenames Duet is the much-awaited 2-player version of Codenames and has an interesting story of how it came about. 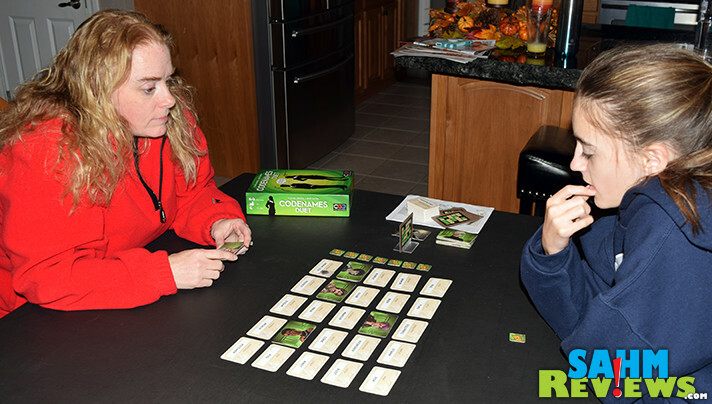 As previously mentioned, Codenames was an instant hit among hard-core and casual gamers, but required a larger group to really shine. That’s where Codenames superfan Scot Eaton comes in. He is (was) a regular game player like the rest of us, but decided to alter the rules of his version of Codenames to allow for only two players. 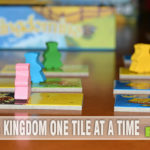 He then asked permission of the publisher to put his new ruleset on BoardGameGeek for others to be able to enjoy their copies with a smaller number of players. 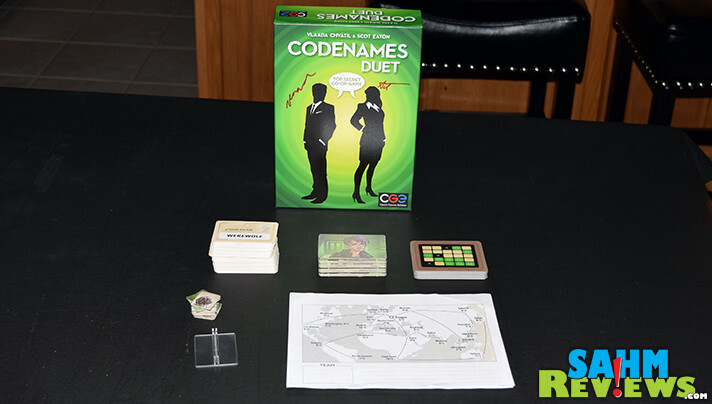 Long story short, they not only gave him permission, they agreed to publish a brand new version of the game, Codenames Duet, with Scot’s name prominently displayed on the box cover along with Vlaada Chvatil, the game’s original designer! The basics of Codenames Duet remains true to the original where you’re trying to discover words by giving clues. 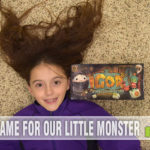 But now the game is cooperative, meaning you either both win or both lose! Individual key cards remain and the rules for clue-giving are unchanged (one word plus a number). 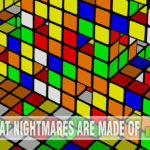 But the number of words you are after increases to fifteen and something brand new is introduced – timer tokens! On your side of the key card you see nine green words. These are the ones you are trying to have your partner guess. Three of the words are also marked in black, these are the assassins. As you might have concluded, you do not want your teammate to guess those words. But they also have nine words highlighted green on their side of the key card along with three assassins! It is perfectly OK for you to guess a card that shows as an assassin to you, as it may actually be a valid clue on their side of the card. According to the secret key in the rulebook, one assassin will be duplicated for both sides as will three of the valid clues. Thus, you only have to jointly discover fifteen words and stay away from five assassins! Each time you take a turn, whether it ends with a missed guess (a tan word) or the decision not to guess any more, you will receive a time token. Your challenge is to discover all fifteen words in nine turns or less! At any time if you guess a word that shows as an assassin to the clue-giver, the game is over and you both lose. 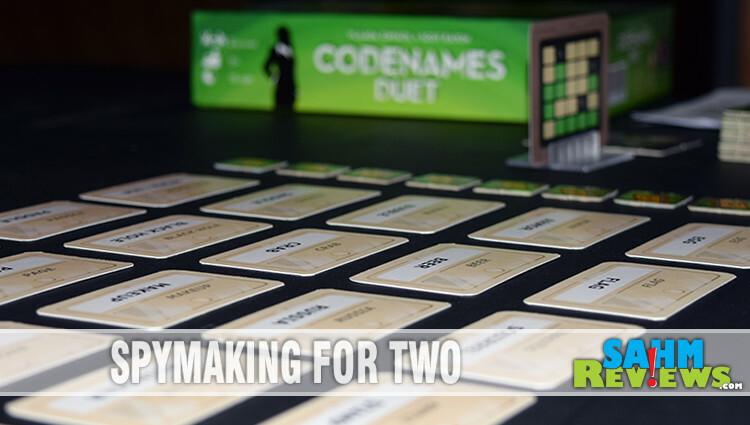 At first Codenames Duet might seem harder since you are trying to jointly discover 15 words without choosing one marked by the assassin or completing it in nine turns, but after a few tries you’ll find that it is quite achievable. Also included is a world map that increases the difficulty with each location. You begin in Prague, labeled with “9=9”, meaning you have nine turns and may make up to nine mistakes of selecting innocent bystanders (tan words). Once you have master this location, you progress to Berlin, Moscow or Cairo. These locations have different parameters for winning – Berlin gives you eleven turns but only two mistakes (11=2), Moscow allows for eight mistakes but only eight turns (8=8) while Cairo still gives you nine turns but limits you to five mistakes. The further you progress in the map, the more difficult the challenge gets, all the way to Vatican City, which lasts eight turns and has no tolerance for any errors (8=0). 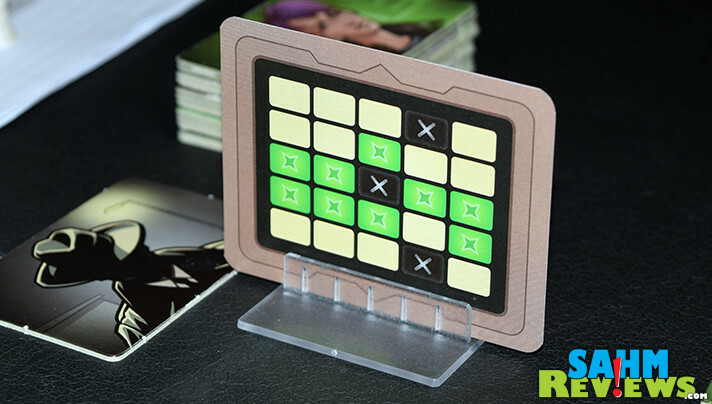 Now we have a solution for those that can’t always get a full party-sized group to play Codenames! Codenames Duet is extremely affordable on Amazon at under $16 shipped and is good for all ages from pre-teen on up. You can still play this version cooperatively as teams, but at such a good price you really should have both in your collection. We’re certain this won’t be the last in the Codenames series, so make sure you are following Czech Games Edition on Facebook and Twitter to find out when the next iteration will be released! 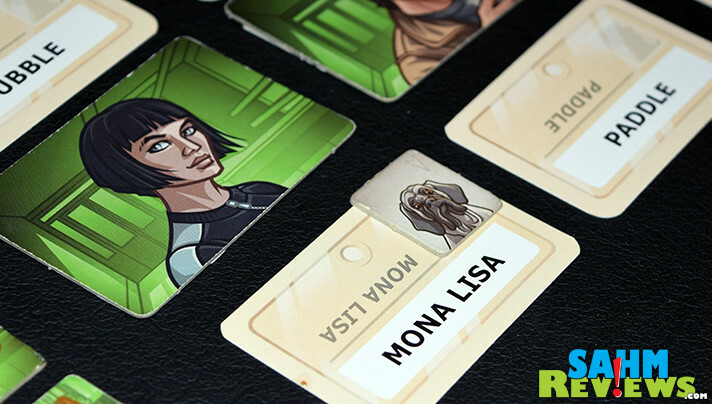 They’ve recently announced on their website that Codenames is also going digital! This will mean unlimited words and expandability! Count us in! 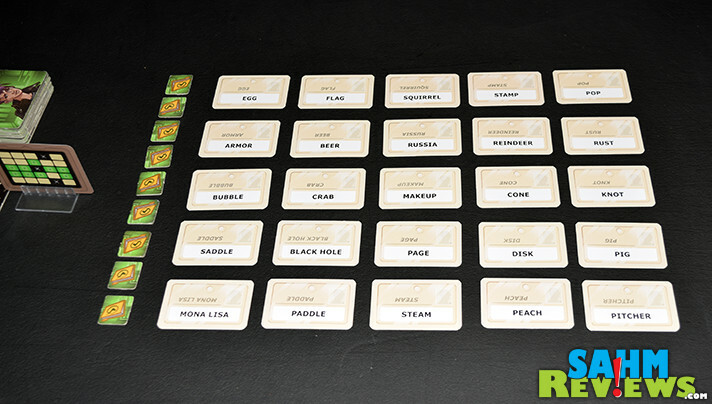 Which versions of Codenames have you played? This Codenames Duet Card Game seems fun! I hope it’s available in my country. I’ll play this with my friends. What a fun looking game. I am interested in seeing if this would be a good idea for a Chritmas gift, totally putting it on my list as an option! 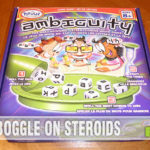 This looks way fun for game night at my house. Clue games are always so fun to see what people come up with. I am sure my husband would love this as a Christmas gift. I haven’t played it, but I’m now thinking if I should get it as after-dinner activity for the upcoming holidays. This game looks great. Sounds and looks new to me but looks very exciting.